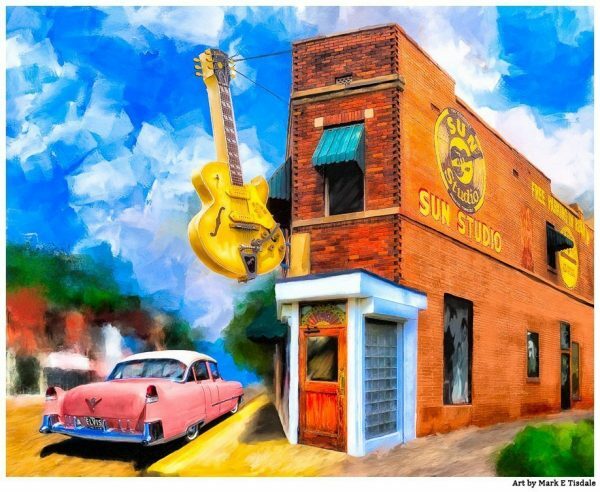 This rock music artwork captures the legendary Sun Studio. This little building is often referred to as the birthplace of rock music. That may be selling it short as it was the birthplace of much of modern music from Rock n Roll, to Rockabilly, R&B, and more. A wide array of musical artists recorded here during the heyday of Sun Studio. Many of those artists are still well known today but in this particular Memphis print, I chosen to recognize one of the larger than life artists who recorded here at the very beginning of his career. The pink Cadillac parked at the door should no doubt stir memories of the king himself, Elvis Presley. I wanted this rock music artwork to capture more than just a landmark. Mind you, in the pages of music history, this is a significant landmark. Of that there’s no question! I wanted an echo of the legend and colorful history of this corner of Memphis. Since it was completed, I think this particular piece has resonated both with people who lived through this era of music history as well as those who love an artistic representation of the heritage of music from the very building that birthed rock ‘n’ roll music. There’s a very dreamy aspect to this artwork. I suspect a fair number of people have gotten this particular rock music artwork print as a souvenir after a pilgrimage to Memphis to experience the musical heritage of the city. I’d love to know how many of you came here searching for a keepsake for yourself or as a gift to someone who has been? In the past whenever people look at this Memphis print, I either here about a trip to Memphis they took or still dream of taking. Not to mention the many people who have mentioned fond memories of living in Memphis. I think there’s an element of nostalgia in this rock music artwork that speaks both to people who love the history as well as people who have sentimental feelings for the place. The fact this artwork seems to bridge those interests makes me proud. Please do pause to share what your thoughts are about this Memphis art print? Did you find yourself here because you were looking for a memento? Or perhaps you’re a fan of Sun Studio or Elvis?